Artist impression of a future league club field in Gosford. The transformation of a major public space in Gosford CBD Is one step closer to reality, with the NSW Government announcing a partner to design and develop upgrades to the Leagues Club Field. Following an open tender process, Sydney-based, Turf Design and Environmental Partnerships, has been selected to implement the works, which include creating a family friendly regional playground and open community spaces. Turi Design bring with them a wealth of experience in designing significant urban parks and community hubs, including Central Park and Sydney Park in Sydney, Goyder Square in Palmerston Northern Territory, and Shellharbour Civic Centre. Hunter Central Coast Development Corporation (HCCDC) Chief Executive, Michael Cassel, said that through community consultation, Turf Design and HCCDC will deliver a city-changing destination, designed to bring people back into the Gosford CBD. 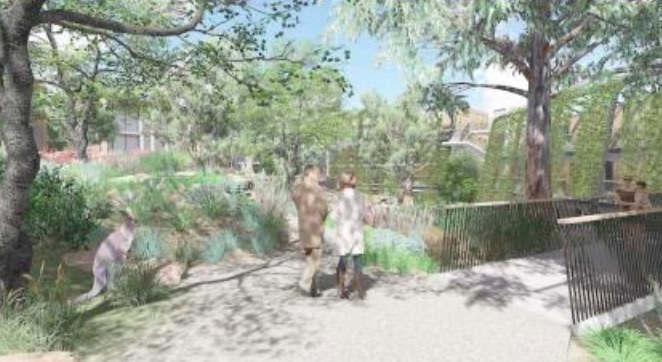 “As well as providing an exciting new public space for the Central Coast community to enjoy, this development will create momentum for the revitalisation of the region’s urban centre,” Cassel said. “We spent four weeks engaging with the Central Coast community and key stakeholder groups to ensure that we meet the needs of the region and its people,” he said. “A consistent theme evident in this consultation process was the desire to upgrade the space in a way that enhances the city and attracts people and businesses into the CBD.” The Central Coast Regional Development Corporation recently merged with the Hunter Development Corporation, which Cassel said would create a better service for both regions. “As the new HCCDC, we’re better resourced and experienced to work with stakeholders such as Central Coast Council, to create opportunities and build developer and business confidence in our regional centres. “This new parkland demonstrates how the NSW Government is delivering on its commitment to revitalise the Central Coast, by creating vibrant public spaces, connected cities and thriving communities.” Concepts for the Leagues Club Field transformation were expected to be finalised by the end of 2018, with construction due to commence in September, 2019.